The guest room is as finished as it'll ever be. Here she is. The extra pillows are in one spot. They make a cozy daybed out of the full-size bed. The vintage handkerchiefs are in ikea frames. 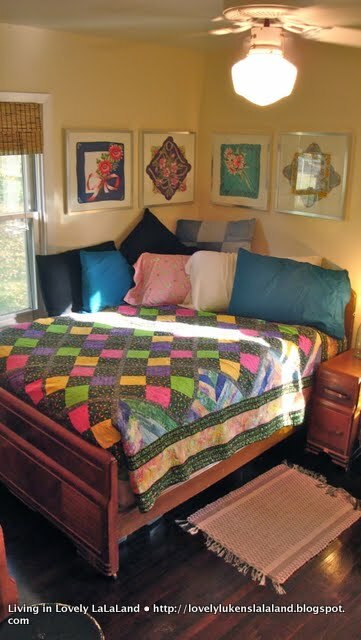 They're as artful as the quilt made by my mom that's on the bed. Things have been progressing in the moving process. We're working on selling this house, finding a home in the new town and all the details in between. But my excitement goes hand in hand with nerve-wrecking fears. What if it doesn't work out? What if it doesn't go as we hope? What if we're making a mistake? When fears start to overcome me I think of my dad's reminder to me during a recent phone call. "Philippians 4:6 'Do not worry about anything, but in everything by prayer and supplication make your request made known to God.' Replace your worries with prayers and let God help you." Adorable. So cute n' cozy!